I’ll finish writing about Ireland someday, or not. Suffice it to say, the rest of the trip was lovely but there were a few more incredibly unpleasant situations along the way. And it wasn’t until we were ready to go home that I’d finally started to get decent rest and feel better. As it turned out, the Mastercard Master Rental insurance program paid all but $285 of the $3,200 that the car rental agency charged me for wrecking the car. Phew! Big sigh of relief there. I’ve managed to reinjure my knee a few times since the trip, so have been dealing with varying states of mobility and and pain since. I’ve had an x-ray and will take it with me to my appointment with an orthopedic surgeon next week. We’ll see what happens. The first photo is from about a month ago, the second was taken just a few days ago. 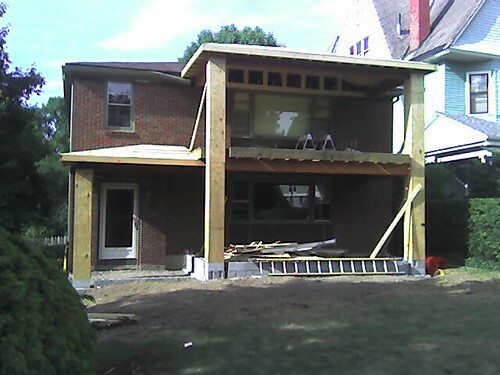 As you can see, double front porches are being added to my two-unit home. This is my mom’s project, she’ll be moving into the lower unit early this fall. She’s also remodeling the kitchen, refinishing the hardwood floors, painting, and installing a boat load of new light fixtures. 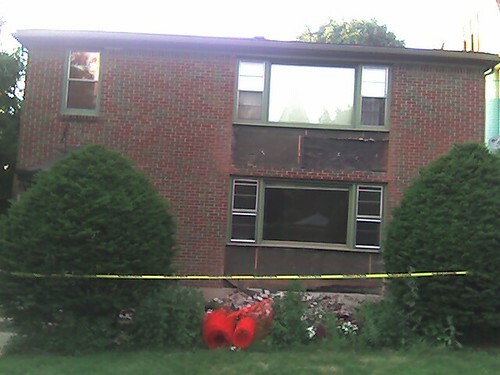 We’re also installing replacement windows in the whole house. All I can say right now is… MASSIVE CHAOS has ensued. On top of daily construction, two recent events have added to the hell that is currently my life. First, my little brown stinker jumped from Mel’s arms and sprained her neck. Seriously. The x-ray didn’t show anything broken, fortunately. So, for the last few weeks we have been carrying her up and down the stairs and giving her anti-inflamation drugs. You try to keep a minpin quiet; no jumping, running, playing, etc., for three weeks. Secondly, Mel has left me. She said no f’n way did she want to live in the same house as me and my mother. Nah… joking! However, did have to take a leave of absence from work in order to go ‘home’ to PA and care for her mother. She was recently released from the hospital after fracturing her spine. Mel’s mom has severe osteoporosis and had tried to do too much one day. We don’t know how long Mel will be away. It depends on whether her mother can get strong enough to be alone and/or if and when Mel’s sister will move back home permanently. Mel did take one dog with her but left me with the two birds and the bad, injured dog. Just as I thought my life was a little troubled, I read your Blog and flowers & rays of sunlight started streaming through my CD port. Keep your chin up, knowing that after such a fantastic weight loss, there’s only one chin to keep up! The house will look stupendous once it’s finished.